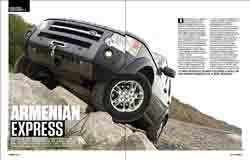 LRO's July issue has a feature entitled Armenian Express about Paul Ratcliffe and his D3. He uses his Discovery 3 hard; it was been driven to Armenia for work reasons and brought home the long way four-up. Smitten with the country, at the end of the contract Paul chose to drive home via a 5000 mile route across 14 countries in the Discovery. Paul's daughters, Libby and Emily, and Emily's boyfriend, Olly, flew out to Armenia and the four set off through Armenia overnighting in Yerevan and Apaga, the latter is a mountain resort town in the Armavir Province of Armenia. Here the hotel owner made the family very welcome and the four enjoyed pony trekking and other activities. The route then travelled through Georgia with a stop in Akhalkalaki, Turkey with stops in Erzincan and Istanbul, Bulgaria overnighting in Sophia, then through Serbia and Hungary before the more local European countries en route to the ferry at Dunkirk. Emily made a film of the trip from Eastern Europe back to Blighty and LRO readers can see it on You Tube.